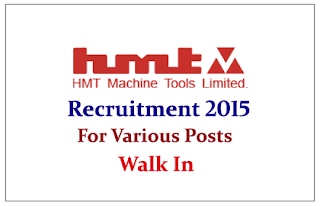 HMT Machine Tools Limited is recruiting for the posts of Technical Associate, Executive Associate, and Jr. Associate for the year of 2015. Eligible candidate can attend Walk In Interview on 18th May 2015. HMT Limited, formerly Hindustan Machine Tools Limited, is a state-owned manufacturing company under the Ministry of Heavy Industries and Public Enterprises in India. The company manufactures tractors, watches under its watch division and industrial machines and tools mainly under its Praga division It has a work force of 2,806 with manufacturing units located at Bangalore,Pinjore, Kalamassery, Hyderabad and Ajmer. Eligible Candidates can attend walk in interview on 18.05.2015, for more details check official notification.